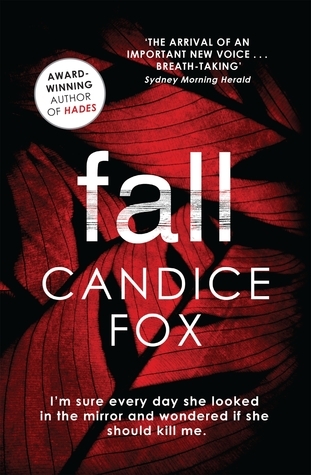 Fall by Candice Fox is the last in the Archer and Bennet trilogy. I have reviewed by Hades and Eden here on my blog as well as on Goodreads. Info taken from Goodreads (since it says it perfectly): Detective Frank Bennett tries hard enough, he can sometimes forget that Eden Archer, his partner in the Homicide Department, is also a moonlighting serial killer . . .
Thankfully their latest case is proving a good distraction. Someone is angry at Sydney’s beautiful people – and the results are anything but pretty. On the rain-soaked running tracks of Sydney’s parks, a predator is lurking, and it’s not long before night-time jogs become a race to stay alive. While Frank and Eden chase shadows, a different kind of danger grows closer to home. Frank’s new girlfriend Imogen Stone is fascinated by cold cases, and her latest project – the disappearance of the two Tanner children more than twenty years ago – is leading her straight to Eden’s door. She didn’t know if what she’d done had been justified, had been ‘right’. She didn’t know if justice was a real thing, anyway. All she knew was that the burning in her chest was eased. The quote above comes from a new character’s POV: Amy. I was a little confused by the introduction of Amy at first, but she was such a great character that she easily became one of my favourites. The switch in POV in this book is excellent, and not only do we get Frank’s, Eden’s, the killer’s and Hades, we get others as well. Frank’s girlfriend Imogen was alway curious to me. I liked the conflict she brought to fall and the way it fed into the plot line overall. The current serial killer is a former fat girl, now scarred woman, who wants to hurt the women runners of Sydney. Her reasons for wanting to do so are understandable (in a warped kind of way) and I think that’s what makes this ‘villain’ so scary.